This beautiful classic band has a slightly rounded body, bright finish and is comfort fit. The comfort fit design features a rounded polished interior that allows the ring to slide easily and rest comfortably on the finger. To keep your jewelry shining and scratch-free, avoid contact with harsh chemicals and chlorine. 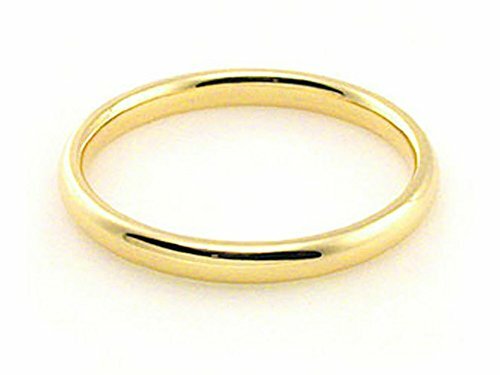 To clean gold jewelry, use warm water and a mild soap. We do not suggest using a brush of any kind. The American Set Co. is a Los Angeles based maker of fine jewelry. No matter your jewelry needs, engagement rings, wedding bands, earrings, fashion jewelry we have you covered. If you can't find what you like in our store please ask us about our custom design jewelry program. We offer custom designed jewelry at wholesale prices. You think it we make it! Our hand-selected collection features an array of diamond and precious metal designs that receive detailed inspection to ensure they meet the highest standards. All diamonds featured in the American Set Collection are conflict free. To assure quality our gold jewelry is always stamped with the karat mark, either 14k, 18k, or 10k and our platinum jewelry stamped plat 950. The American Set Co. offers customer service that is available seven days a weekia email to answer any product questions before, during or after the purchase. We will respond within 24 hours (response times an be slower during the weekend or holidays). 30 Day returns or exchanges; 100% satifaction for our customers is our priority. American Set Co. fine jewelry is made with only pure natural geniune materials. If you have any questions about this product by American Set Co., contact us by completing and submitting the form below. If you are looking for a specif part number, please include it with your message.